Reminiscent of E. B. White's "Charlotte's Web" and Richard Bach's "Jonathan Livingston Seagull," one Korean bestseller, "The Hen Who Dreamed She Could Fly" by Hwang Sun-mi is becoming popular among English-speaking readers. Penguin Group will publish the first English-language edition in the United States on Nov. 26. It is already a contemporary classic in Korea and is being published by leading companies around the world. With illustrations by Japanese artist Nomoco, it has sold more than 1.5 million copies in Korea and has been on bestseller lists for the last ten years. The book is an adventure story that explores philosophical themes such as freedom and individuality. Penguin's senior editor John Siciliano said that this is a story about an unforgettable, plucky, spirited heroine and motherhood. When he first read it, he believed it would be a classic because the story is beautiful, universal and well-written. "It is going to last for years and years. I hope it will get published as a Penguin classic for years from now," he said. The editor has been looking for a book from Korea for many years. He has published books by writers from all over the world — including Scandinavia, France, Germany, the Middle East, China and Japan but rarely receives submissions from Korea. "I was desperate to find a Korean writer because I have been interested in Korea, I have been to Korea and I have Korean-American friends. We care about Korea in the news. It's a fascinating place. 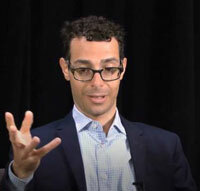 I have been looking for a way to help American readers understand Korea better," he said. He said that it is known as a book for young readers in Korea but over time it has become a treasured contemporary classic read by so many people. He expects that the book will be loved by adults too. "We are publishing it as a book for adults as being published in many countries around the world. And I have expectations that it will be shared by adults with their children and then rediscovered by children on their own as well," he said. Since its first publication in 2000, the book has topped the bestseller lists for ten years. It was also made into an animated film and has been adapted into a comic book, a play, and a musical and the rights of the novel have been sold to leading publishers in more than 15 countries. An edition of it in Polish was selected as the Best Book of the Year 2012 by Granice.pl, the online literary community in Poland. The novel was chosen as the Best Book of Spring 2012 in the same category. It was published in the central European country by Kwiaty Orientu, a publisher keen on introducing Korean books, in February 2012. The story explores universal themes such as parenthood, self-sacrifice, friendship and belonging and the significance of mortality. A hen named Sprout lives in a coop and every morning she is forced to give up her eggs to be sold at the market. She is eager for freedom and to hatch her own baby chick. After Sprout escapes from the barn into the wild and finds a stray egg, her strong maternal instinct takes over and she waits for it to hatch. Along with Straggler, a wild duck, who becomes her friend, she fights against antagonism from the other barnyard animals. Against all odds, Sprout proves herself to be a plucky, indefatigable heroine who learns about the immense sacrifices it takes to become a mother. 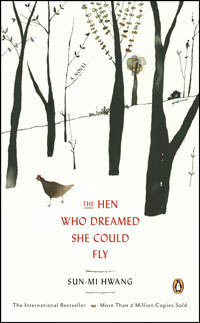 The novel has drawn rave reviews from authors and critics in the U.S. "Sometimes the simplest character, expressed in the sparest prose, embarks upon life's most heroic journey ... Sun-mi Hwang's lovely "The Hen Who Dreamed She Could Fly" [is] a novel uniquely poised at the nexus of fable, philosophy, children's literature, and nature writing," said Adam Johnson, author of the Pulitzer Prize winner and New York Times bestseller "The Orphan Master's Son." Krys Lee, author of "Drifting House," said: "The Hen Who Dreamed She Could Fly breaks down boundaries between animals and humans and takes us onthe intensely personal journey of a lonely hen whose simple, fierce desires guide her to surprising places. This entertaining and plaintive tale is South Korea's Charlotte's Web for youth and adults alike." Publishers Weekly said: "This simply told but absorbing fable ... explores the joys of parenthood and the sacrifices required to nurture the next generation, the healing bonds of friendship, and the tug-of-war between nature and nurture. Spare but evocative line drawings ... add to the subtle charm." The author has won numerous awards and published more than 40 books enjoyed by adults and children alike. Born in 1963, she graduated from the creative writing departments at Seoul Institute of the Arts andGwangju University, and the graduate school of Chung-Ang University. Its translator is Kim Chi-young renowned for working on the bestselling Korean novel "Please Look After Mom" by Shin Kyung-sook.